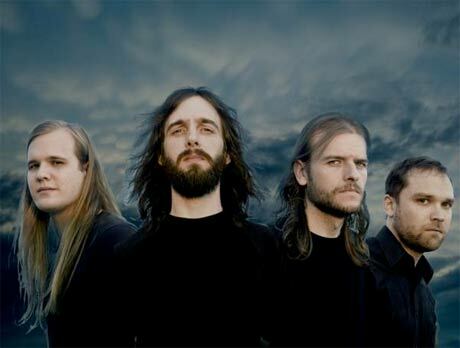 Austin, TX-based groove metal champions the Sword have announced that their highly anticipated third album is complete, and will be released later this year. The band's previous album, Gods of the Earth, was released in 2008. While the new album doesn't yet have a title or solid release date, we do know that the record will be released sometime in 2010 via Kemado and that it was recorded with Isis/Mastodon producer Matt Bayles. Sword front-man John "J.D." Cronise recently spoke with Decibel about the project, dropping the news that it has all the makings of an epic concept album. This is what you'd technically call a "concept album," though I'd describe it as more of a soundtrack to a story I came up with. All the songs are about aspects of the story, but they don't cover every detail from beginning to end. It's a science fiction story, and it deals heavily with themes of light and dark and perceptions of time. One of the main settings is a planet, which has experienced tidal locking, creating a side of perpetual day and a side of perpetual night. The reason for creating a narrative to base the songs around was essentially to provide interesting and varied lyrical subject matter with a core theme to tie it all together. Unfortunately, that's all the band are giving us to go on so far.